This tutorial demonstrates how to use Wikipedia offline from a USB flash drive. You can now easily download the entire Wikipedia and use it offline from any external storage device like USB flash drive, external hard drive, etc. To download Wikipedia, you don’t need to use any third-party software as the database is made available for everyone to download from Wikipedia’s website itself. There are different types of Wikipedia database which you can download like current revisions only (without user pages & talk) current revisions (with all pages and talk), page abstracts, articles title only (with redirects), and so on. Apart from that, it also has an option for special export where you can choose a specific list of articles or category to download. All the Wikipedia database download links are provided from itorrents.org, which means you would need to use any of the torrent clients to download Wikipedia on a USB flash drive. To get started, the first thing you would need to do is go to the database download page of Wikipedia. Now, under the “Where do I get it?” section, click on the “Download” link, as shown below. In this section, you will also see the details of all types of database like current revisions, all revisions, etc. 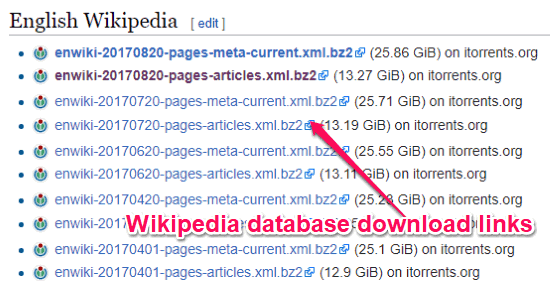 and which file you need to download to get any of these specific Wikipedia databases. As soon as you click on the “Download” link, a new page will open up with all the database download links for different types. Each of the download links will also display the size of the database. Now, to download any of these databases, all you got to do is click on the download link. As soon as you do that, a torrent file will be downloaded which you can open with any torrent client to start downloading Wikipedia. To use Wikipedia from a USB flash drive, make sure the download destination is set to the USB drive. Once the downloading is complete, you will see a compressed file which you can extract using any unzip software (like 7Zip). After that, you will get an XML file with all the articles from Wikipedia. You can now open this file with any XML viewer and read the articles offline. 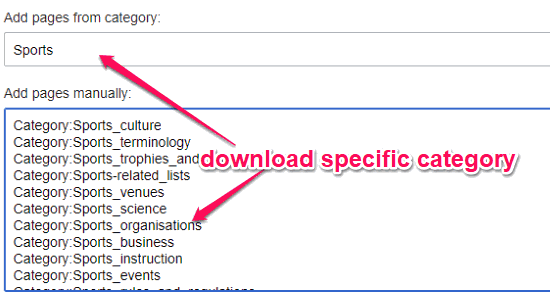 If you would like to download a specific list of pages or category from Wikipedia, then all you gotta do is go to this “Special: Export” link. After that, you will be able to enter any category name or pages manually and then download them to the USB flash drive. 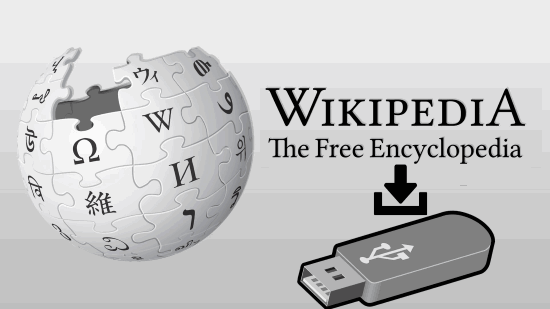 This is how you can download and use Wikipedia offline from a USB flash drive. Wikipedia can also be accessed offline using third-party software (like XOWA), but you cannot carry Wikipedia around with these software as you can do that by downloading it on a USB flash drive.